Highland Park is regarded as the best soccer field in York Region, due primarily to the efforts of our Director of Property and his support volunteers. The main field has lights for night time games and also an adjacent training pitch. The field is used by the ASC senior teams as well some games for Aurora Youth Soccer. The Clubhouse is adjacent to the field and provides a range of amenities including the largest licensed patio in Aurora! Food and beverages are provided throughout the year including hot and cold food from the fully licensed Bar. With a Barbeque on the outdoor patio, food is regularly available to support our patrons and soccer fans during games. With games almost every night of the week, we invite you to come by and check out the facility and share the passion. The Clubhouse is non-smoking and kid-friendly, so bring along your children – they are always welcome! The Clubhouse bar has a huge screen and an HDTV projector, which makes it ideal for watching live soccer games from around the world. 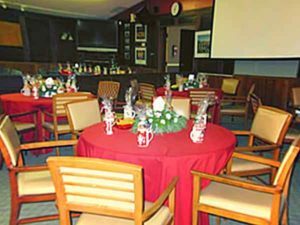 The Clubhouse is available at very reasonable rates for private rentals be it a birthday, private party, anniversary, sporting event, etc. 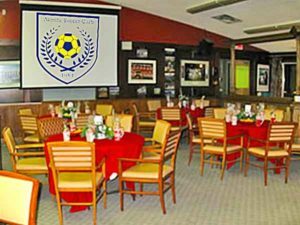 To book contact Tom at 905.727.7759 during working hours, or via email, if you are looking for a facility for your private function. The Clubhouse includes two change rooms for home and away teams equipped with showers, a bar, a full kitchen area, a large fully licensed outdoor patio, a dance floor, a big screen TV, a 10′ by 10′ movie screen, a fireplace, dartboards, tables and chairs for dining, washrooms, and plenty of parking.